Water Wipeout, the South West’s Greatest Water Fight! 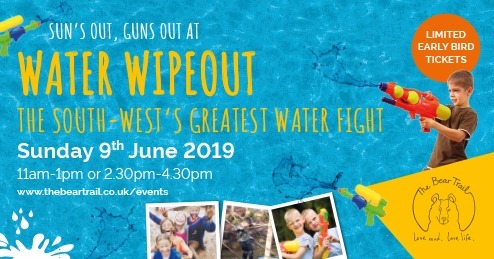 The Bear Trail are proud to announce “Water Wipeout” – our brand new event for 2019. Perfect for kids big and little, families will tackle our awesome family assault course, while dodging the Water Wipeout Crew, stationed around the trail. There’s 28 obstacles to climb, slip, slide, run, zip, and swing under, over or through whilst trying to escape our Crew! But….. they’ll be well-armed with Super Soakers, Water Bombs, Pistols, Water Sponges and more. And on a mission to ensure EVERYONE ends up soaked! To make this a riot of colour, pistol replenishing stations filled with coloured water will be placed around the trail and a “Bomb Barrel” will hold hundreds of pre-filled water bombs. Kids can bring their own water pistols and super soakers to the Trail and join the enormous water fight that will mark the start of each time slot. There’ll also be a slip ‘n’ slide area, target practice to hone your shooting skills and the chance to soak Bear Trail staff in the stocks! Early Bird tickets are just £11.50 (Over 1m); £8.50 (Under 1m) and £44 (Family of 4) – but once they’re gone, they’re gone! !